Preheat oven to 400 degrees F. Toss tomatoes with 2 TBSP EVOO and 1/4 tsp each of salt and pepper. Roast tomatoes cut sides up, in 1 layer in a 4-sided sheet pan until skins wrinkle and the tomatoes are beginning to brown on the bottom, about 45 minutes. Cool completely. Cut basil into fine shreds. 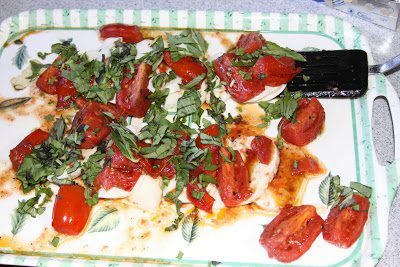 Arrange mozzarella and tomatoes on a platter and sprinkle with basil. Drizzle with vinegar and remaining oil. Season with pepper.